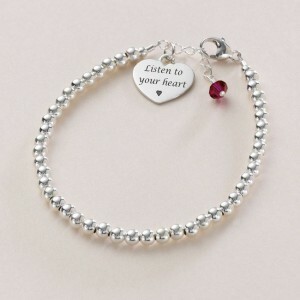 Sterling Silver Beaded Bracelet with Engraved Heart and Birthstone. Dainty Beaded Sterling Silver Bracelet with Engraved Heart and Birthstone. A very high quality bracelet made from .925 Sterling silver. An extension chain (with a Swarovski Elements crystal birthstone at the end) is attached to ensure a perfect fit. « Beautiful Multi Ring Bracelet with Engraved Heart.